David Risley Gallery is delighted to announce Indoor Paintings, our first solo show of new works by Danish artist Torben Ribe. 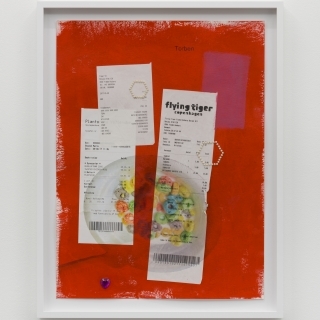 Torben Ribe's new works, Indoor Paintings, cut and paste literal objects into the language of abstraction. The status of these works is fluid but they are definitely paintings. We can be sure of that. Enough of the language of painting is there to reassure us of this. These works are not merely painted, though. They are constructed, put together, taken apart, messed up, fixed. They are, at once, abstraction and concrete realism. Woodchip wallpaper--insisted on by landlords to cover dents and knocks in walls and later painstakingly removed by aspirational property buyers--re-enters the home as the surface of a seemingly abstract painting. Other unavoidable daily inanities find a place in Ribe's work: among them, oatmeal and other cereal products, cords, print advertisements, electronic [weather stations. These are products so bland and ubiquitous that they are routinely camouflaged in beige, made invisible, stripped of aesthetic properties. Boring things shape-shift. Ironing boards recur throughout the show in different guises--standing, leaning, as plinths, as a painting element, a stand for a projector and, finally, as sculpture. The works read as relics constructed from the everyday invisible. Torben Ribe's Indoor Paintings are not so much vanitas, reminders not of death but the artificial extension of life, banality rendered in perpetuity. Stilled lives. The projects often begin as a conceptually strong and well-rounded efforts to make a really good and refined abstraction .....But before long, the everyday reality gets the better of this ambition of making a solid abstract painting, and chance, uncertainty and lack of skills start winning the battle from there on.